Wow! This was quite the storm and another reminder (they seem to coming more and more frequently) of how little power we have against Mother Nature. New York looked like New Orleans in 2005 and the damage caused along the Jersey Shore and all throughout the tri-state area is unbelievable. If we didn’t just live through this storm, it could have easily been confused with photos taken from a special effects edit bay on the set of War of the Worlds or The Day the Earth Stood Still. But it’s very real and it left millions without power and brought the most densely populated area of the country to a stand-still. The horror stories being reported are terrible, with people losing literally everything. I feel for everyone affected and I’m extremely grateful not to have suffered any injuries or major damage. It will take time to rebuild everything that was destroyed during Sandy’s 24-hour rampage, but as we’ve seen before, we will move forward. People and communities from all over will join together and offer assistance. Eventually the entire northeast will re-establish a sense of normalcy. For all of the sadness and loss that has been brought about by Sandy, there are an equal number of heroic stories. My favorite involves hospital workers wheeling a woman in labor, in the dark, to another hospital after their generator failed. Minutes after arriving at the other hospital, she delivered her healthy baby. That’s one of millions of stories which showcase the true heroism and selflessness that such treacherous situations require. Emergency responders have been working non-stop for the past 2 days and some haven’t even been to their own homes yet. Without these people, who knows how much worse the damage could have been. Although this is such a difficult time for so many, I am always enthralled by the stories of everyone (from firefighters to policemen and women to EMT to volunteers to bystanders) working together to help those in need. It’s a great reminder of what we are capable of and that regardless of any differences, we are all in it together. Game Day! Time to avenge our Week 1 loss to the Cowboys. What better place to do it than Cowboys Stadium, the monstrosity of a venue that the Giants have never lost in. We’re coming into this game off 2 nice wins but don’t expect a letdown. 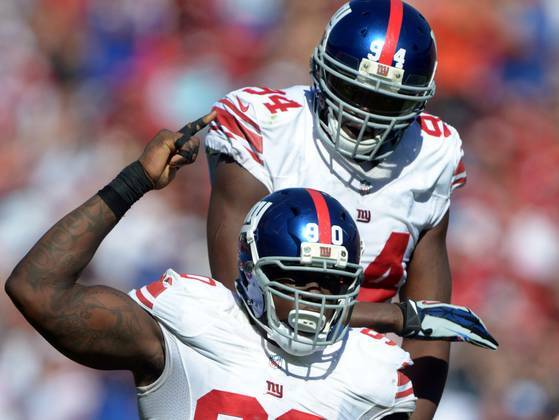 You know that Coughlin and company don’t want to lose twice to the Cowboys in the same season – Let’s go GMEN! Ian O’Connor wrote a great piece today on ESPNNewYork.com entitled “Who Thought Eli would be this good?” My first thought when I saw that headline was “Me, I thought he would be this good.” I’ve been saying it for years. When the Giants drafted Philip Rivers fourth in the 2004 draft and then traded him for 1st overall pick Eli Manning, I felt confident it was a move that would pay dividends. 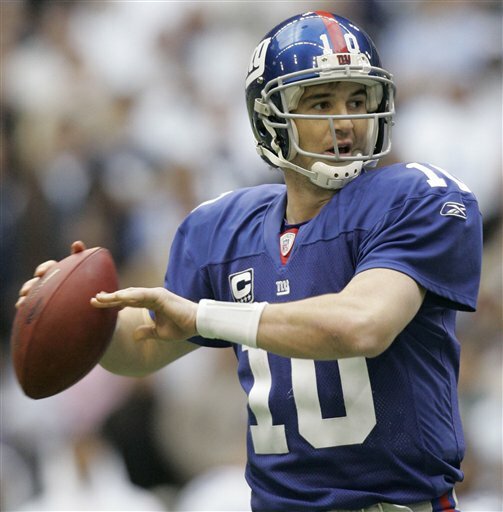 Eli would be the guy who was going to bring championships (that’s right plural) to New York. I had a hard time making believers out of anyone that I expressed my opinion to before 2007. A few people were more receptive to the idea of Eli as an elite QB after his first Super Bowl, but there was still many doubters. After 2011, my feelings on Eli were finally the majority opinion and now we get these articles about how he isn’t just the best clutch QB in the league, but he is the best QB in the league period. When no one believed in Eli, it didn’t bother me one bit – even when he was throwing off his back foot with that exasperated look on his face and his hands in the air. It was part of the learning curve and it didn’t help that he had to deal with selfish receivers. Getting receivers who were more concerned with the team than their individual touches coincided with Eli’s rise in ability and confidence. Shockey got hurt and Eli asserted himself as the leader of the offense and the leader of the team. That led to the 2007 playoff run and once he had the first little bit of success, it snowballed. He became the leader that led the 2011 team to another Super Bowl and the guy that has conditioned his fans to expect 4th quarter dominance, no matter the situation. It takes takes time for a quarterback to mature and come into his own and that is exactly what Eli has done to this point. It wasn’t that crazy to list him as a good quarterback even before 2007. He made the playoffs in his first two full seasons as a starter (an accomplishment on its own) but failed to win either of those postseason games. After 2 Super Bowl MVPs and countless 4th quarter comebacks over the past year, he not only has his locker room behind him but everyone agrees that he is one of the best quarterbacks in the league. He has turned undrafted wide receivers into superstars and he’s just at the beginning of his prime. Even my high expectations from back in ’04 can be exceeded. He doesn’t win every game because that is impossible, especially in a league with such great parity. But he wins the big ones and I would want no one else under center. He’s going to have a better career than Peyton, something that was laughed at when I said it back in ’06. I always believed we had a superstar and now that the rest of the world has figured out what I knew along, I couldn’t be happier. During the final presidential debate leading up to Election Day, moderator Bob Schieffer fell victim to the unfortunate coincidence that the most powerful man in the free world and the man he killed, who was the USA’s biggest threat, have names differing by only one letter. “We know that Pakistan has arrested the doctor who helped us catch Obama-uh-bin Laden,” Schieffer said, realizing his slip of the tongue immediately but not correcting himself. It’s a mistake that you never want to make given the dichotomy of what the two men stand for, but he is not the first to make it. During media coverage of Osama bin Laden’s death in May 2011, many media members made the same mistake. ABC News ran a scroll on its website declaring “Obama Bin Laden Dead.” Diane Sawyer’s blog reported that “OBAMA WILL BE BURIED AT SEA.” Geraldo Rivera said “Obama is dead” on Fox News before correcting himself. And those are just the tip of the iceberg. The first time I ever heard the error, it was a not an error at all. 30 Rock brilliantly wrote it into an episode while Obama was running for President back in 2008. The self-absorbed and far from intelligent Jenna Maroney is the victim of the slip of the tongue (or more likely pure stupidity). Either way, Tina Fey and company were way ahead of the potential for disaster surrounding the two news-makers’ almost identical names. Hearing the mistake made again last night brought me right back to Jenna on Hardball and was just more proof of how great 30 Rock was and continues to be. Jack White has had some career and everything that he does seems to be critically acclaimed. It’s easy to see why. I’m just grateful I stumbled upon that live show in Austin and it led me to his first solo album. The government is spending money on what? 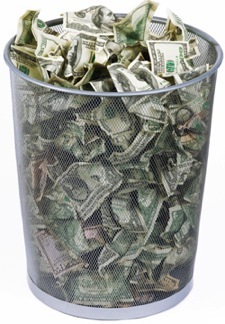 A new report from Senator Tom Coburn’s office reveals many different examples of government waste in the past year. When I saw the study, I didn’t think much of it because it is a well-known fact that the American government is an inefficient bureaucracy. Seasons change and the sky is blue – nothing to see here. However, I continued to read the findings and was taken aback at exactly what the government was spending taxpayer money on. Here’s a couple examples and please think about these the next time you see the year-to-date amount taxed on your next paycheck. The government put aside $325,000 for the development of a squirrel robot that is so realistic it can deceive a rattlesnake. Add that to $40,000 spent on production of a video game where players can virtually enjoy a pond in Massachusetts. That’s not the only video game the government is developing though. It spent $516,000 on a video game called “Prom Week,” which simulates the interactions of teenagers surrounding the much-anticipated rite of passage. Your tax dollars are also contributing to the $1 million a year that NASA puts towards researching what astronauts would be able to eat on Mars even though there no plans for a manned mission to the Red Planet. Finally, $150 million a year are contributed to The Murtha Airport in Johnstown, PA by none other than representative John Murtha. The airport boasts a $7 million air traffic control tower, $14 million hanger, and $18 million runway big enough to land any airplane in North America. There are exactly 3 flights a day in and out of John Murtha Airport. It’s ludicrous that this type of spending is allowed to occur. It’s so ludicrous in fact that Ludacris himself would denounce this reckless spending (and he owns a Ferrari 458 and a Rolls Royce Phantom Drophead Coupe). I understand that the amounts listed above are marginal compared to the amount the government actually receives in taxes but there is absolutely no reason any amount of money should be spent developing two completely worthless video games. Aren’t there private companies spending their own money on such ventures? The government has bigger things to worry about and the fact that it even spends a penny on a virtual New England pond is embarrassingly hilarious. It’s kind of like when someone has just inherited a fortune and has too much money than they know what to do with. “Let’s spend some money on an airport and never use it,” said the guy who’s net worth just jumped from $50,000 to $50 billion. America doesn’t have so much money that we don’t know what do it with all. Has the government forgot that we’re in trillions of dollars of debt and our economy hasn’t been this unstable since the Great Depression. We need to be frugal and smart and make wise investments now more than ever unless we want to be more in debt to our biggest threat China. Let’s wisen up as a country and a government. If we start allocating all of our money to the right places, the country will get back on track. If I were involved, my first step would be cutting the video game and useless airport budget. Maybe then we can avoid the heated Presidential debates centered around tax plans. I’m sure this is easier to say than do and I’m not naive – I know the country isn’t in debt because of the video game budget. But at least it would be a start and show the country we are making an effort to use the taxed income wisely and efficiently. What do we really know about the NFL after 6 weeks? No team has come out and put together a perfect 6 weeks. Yeah, the Falcons are undefeated but if you have watched any of their games (the last 2 being last second wins at home vs Carolina and Oakland), you would agree there was nothing perfect about them. This season has not followed the same script as last year’s for a number of teams. Four of last year’s top teams during the regular season (Packers, Saints, Patriots and Steelers) have a combined 9-16 record. So much changes week to week in the NFL and this is an update league. Given the events of Week 6, I ‘m updating the Giants to best team in the NFC. On Sunday, the Giants played the best 60 minutes of football that they have played since the Wild Card game vs Atlanta in last year’s playoffs. The 49ers were coming off 2 dominant victories in which they outscored their opponents 79-3. The Giants didn’t seem to care about what San Francisco had accomplished this season and came out west with their own chip on their shoulder. The defense played fantastic and the pass rush reappeared causing Alex Smith to make some very poor decisions. The result was 3 interceptions and just 3 points from an offense that had 300 rushing yards and 300 passing yards in the same game last week. Eli and the offense did it’s thing and most importantly they established the run. Bradshaw became the 1st visiting player to rush for 100 yards at Candlestick since ’09. 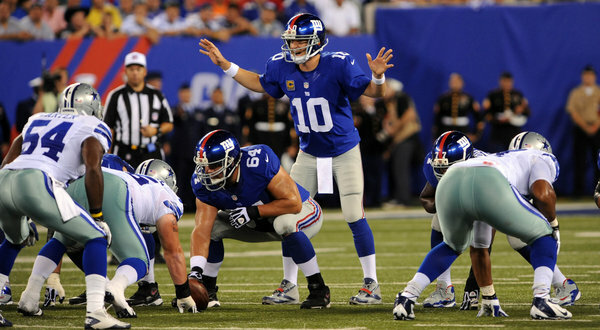 The line deserves a lot of credit for Bradshaw’s performance and for keeping Eli upright when he went back to throw. Manning got sacked 6 times and knocked down on almost every dropback in last year’s NFC championship game. Sunday’s rout was a much cleaner performance (literally) for both Eli and the line. If the running game can continue to balance out the offense and the line can continue to give Eli time, this offense is as potent as any in the league (including Green Bay). This was a statement road win that without a doubt reasserts the Giants as the cream of the crop in the NFC. I wouldn’t be surprised if the Giants and Niners met again in the postseason. It’s a long season and it often takes time to figure out what type of your team you are going to be. When the Giants get that inevitable identity complex due to their stacked schedule later in the season, they can look back on Sunday’s dominant win and remember just how good they are capable of being.